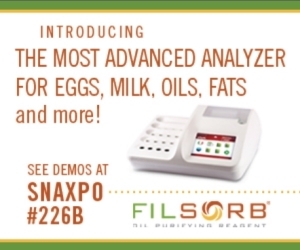 CDR and Filsorb will present the new CDR FoodLab® at Snaxpo, the world’s premier event for the snack food industry. The 2015 edition will take place in Orlando, Florida. During the fair days, from 28th to 31st March, the booth at which you can find CDR FoodLab® and see demos of the analysis method with the new system is #226B. At the booth it will be possible to perform practical analyses of the main quality parameters for snacks, fats and oils, eggs and milk. Everyone is welcome to see the innovative characteristics and functions of the new analysis system, that analyze food as is or with a very simplified sample treatment. Many applications are possible with the new CDR FoodLab®, evolution of the previous models FoodLab and FoodLabFat that are widely used and widespread in the food industry companies worldwide. The staff in fair will be ready to welcome visits from anyone of Snaxpo’s international audience interested in discovering the new CDR FoodLab® and its technical and analytical characteristics. CDR FoodLab® preview presentation at Snaxpo 2015 was last modified: May 30th, 2017 by CDR s.r.l.